We are reminded to return to the basics during crises or when business seems to be at a dead end. For example, we may all be familiar with Newton’s third law of motion, which states for every action, there is an equal and opposite reaction. In business, this might make us think of what outcomes to expect when we execute a strategy or course of action. Marketers need to prepare for most probable scenarios and prepare ahead of time for competitive acts and not while the attack is happening. After all, we already know there will always be a reaction when there is “provocation’. If you’re in marketing, there is Ries’ and Trout’s Immutable Laws of Marketing and in particular, Law #9 or the Law of the Opposite. This law noted that “If you are shooting for the second place, your strategy is determined by the leader.” In this case, one needs to be careful about the “law of foolish fellowship” where one follows blindly what the market leader is doing just because. Being a “me-too” or a copycat is just playing catch up or may seem desperate. 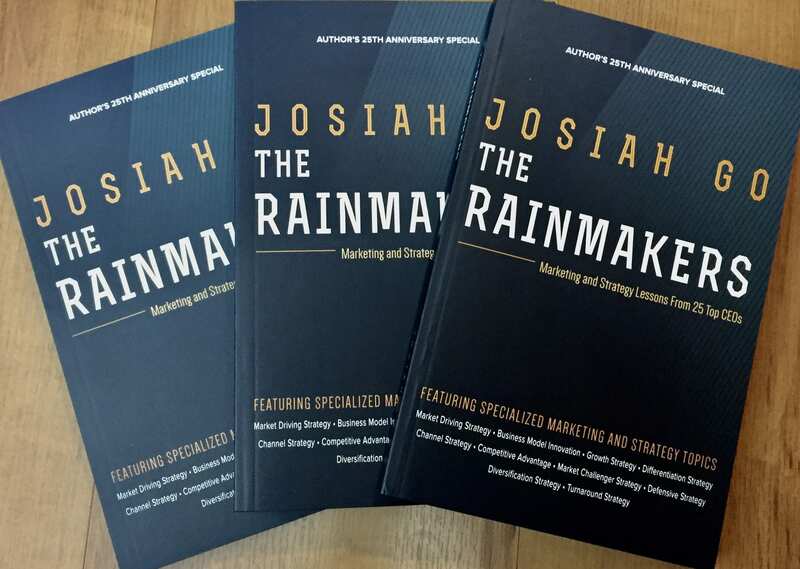 Then there is Josiah Go’s article last week, which discussed market-driving strategy where companies must always try to be different, not just to be better, or to be relevant not just unique, as a way to attract noncustomers by identifying pain points and thus expand the market. How do these “basics” translate to actual situations especially for those who are in a challenged position? Why go the same route as the current leader? Why try to compete based on number of tweets? How do we anticipate and create the next big thing? Yet while remembering the basics, we also need to develop other ways of making sense of what is happening. The next challenge for marketers is how to think out of the box, to stop doing the same thing (or using the same problem solving techniques) and expect different results. Consumer behavior is not usually rational and yet marketers keep putting people in boxes (or segments) and do their predictions according to past experiences, to connect to future trends. But is it really all linear and clear cut? Perhaps the social sciences can bring in new perspective, especially in the ongoing TV network wars, since most strategies seem to just look into numbers, both in ratings and in social media. Madsbjerg (2014) observed how corporate people merely deployed the usual business tools to cull insights from consumer behavior. He suggested that it is time to change certain beliefs particularly in assuming that people are rational and predictable beings or that all one has to do is design the right algorithm or get big data. He suggested the importance of using a human-science-based process, which looks into how people experience life. “Management science can tell Starbucks, for example, how many cups of coffee its customers will drink in a day; phenomenology reveals how those customers perceive their coffee experience.” One of the “tricks” in shifting lenses is to reframe: where the marketer looks at how the customer perceives the situation instead of how the business defines the problem. Though not quite the same as the kalye serye (street series) genre, research in this area shows that people watch reality TV for entertainment, perceived escapism and social affiliation (Lundy, Ruth & Park, 2008) among others. Eric Jaffe (psychologicalscience.com) also shared a report by Reiss and Wiltz (2004) that looked into why people watch reality TV and one study found that “media events repeatedly allow people to experience 16 desires and joys. Drawing on the uses and gratification theory — which suggests that people select media to fulfill certain needs — as well as the sensitivity theory, Reiss predicted that reality viewers would display a collective Desire Profile.” These needs include curiosity (joy of wonderment), honor (joy of loyalty), social contact (joy of fun), social status (joy of self-importance), etc. The Aldub kalye serye seems to satisfy many motives (based on the Reiss profile) that simply bring joy, which include desire to obey tradition or a moral code, desire to play, desire for courtship and romance. It is possible for the other networks to look at other motivations that also bring joy such as curiosity or desire for knowledge, idealism or desire to improve society, order or desire for rituals, among others. Fun seems to be a powerful force. In China, more comedy TV shows are coming out with improvisation as its lead concept. “Laugh Out Loud”, became China’s second most-watched channel since it was launched in 2013. This show, according to netizen’s statistics, is able to make the audience laugh every 8 seconds using stage sets as the focus of its plots. What does this China TV channel teach us? Does this satisfy the desire to play (fun), desire to exercise muscles (vitality) or desire to win (vindication)? By looking at the motivations of TV viewers using social sciences, perhaps marketers can be able to predict the unpredictable, or create the next big thing.